Tail wags, wet noses, lots of love and puppy therapy…that’s what beautiful homes are made of. Have you considered adding a furry friend to your family? Dogs bring a lot of happiness and positivity to your home and your heart. And like they say, the best things in life come free! So don’t worry about spending fortunes to get a puppy home. All you need to do is look around and you’ll find so many homeless puppies hoping to get adopted. Desi dogs are the strongest, most intelligent and loyal and you definitely won’t regret getting one home. 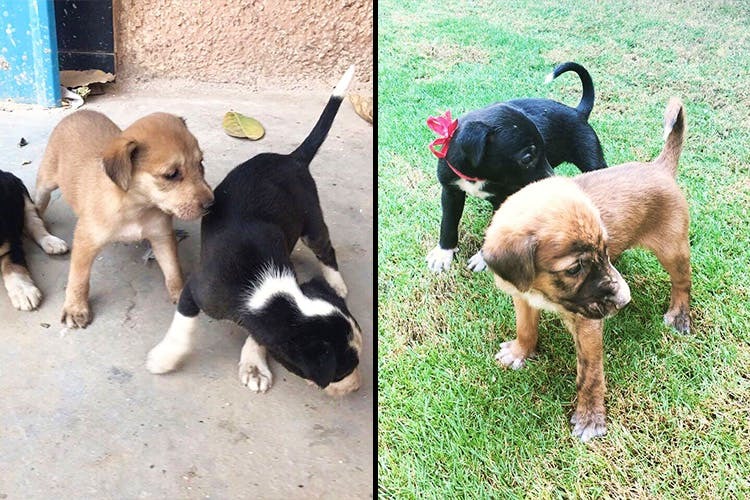 Here are four oh-so-cute puppies up for adoption in Delhi NCR at the moment. Get in touch with For The Fur Kids on Facebook/Instagram if you wish to adopt them. Our cuddly boy Fatty is in the search of humans he can call his own. He is about five weeks old and is looking for a family full of love, just like he is full of so much fluff. He is a little shy, but once he opens up it is a delight to play with him. Fatty will be an ideal fit for first-timers as well as experienced pet parents. PS: He has tasted a bit of chicken soup and loves it! Check out his adoption post here. She is naughty, enjoys soft toys and loves licking her humans! She is one of the naughtiest in her litter, loves playing with her siblings and has adorable natural white socks over her paws! Reach out if you genuinely want to adopt a desi dog and are willing to love her forever. Piggy has loads of love in store for you. Will you make her a part of your family? Check out her adoption post here. ChocoLava is that bundle of joy you would love to take home! Shy at first, he makes sure every human falls in love with him once he begins to play with them. His eyes have a sparkle that we’re yet to see with any other puppy and his presence has so much positivity that you won’t be able to resist him. Lots of love, running around in open spaces and chicken flavoured chewsticks are a few of his favourite things. Luna’s wet nose and calm temperament have won her foster’s heart. She is a beautiful desi girl who loves sleeping in her human’s lap. Approximately 4 weeks old, she is very observant and has unlimited licks to offer to anyone who earns her approval. She wouldn’t mind belly rubs in return! ? Baby Luna’s sister found a home recently and now she is hoping she will be adopted by a loving family too. She promises to be a good girl, eats whatever is offered to her and does not chew on shoes much. Get in touch with For The Fur Kids on this number: +91-9810424152 and take home a bundle of joy. Send a message on their Facebook profile here or DM them on Instagram.